The John Adams Book Club meets monthly to discuss a book from the rich range of American literature, fiction and non-fiction, from classics to current bestsellers. Our objective is to explore American culture in its myriad of aspects – literature, art, politics, history, race relations, landscape, economy, education, science, technology, society. Coordinator of the John Adams Book Club is Glen Kendall, an Amsterdam-based American with a life-long passion for books. As a veteran of the Vietnam War, he is also one of the authors in The War We Would Forget: Dartmouth Veterans and the Vietnam War. Glen coordinates the selection of books and the discussions based on recommendations from the Club members. The discussions are always animated, very interesting and highly enjoyable. We have assembled an excellent group of members with different backgrounds and life experiences. And the refreshments after the discussion allow for more informal conversation. The John Adams Book Club meets once a month. Members can choose either a Wednesday or Thursday meeting. 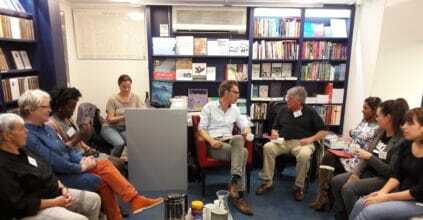 Meetings are at Athenaeum Boekhandel, Spui 14-16, Amsterdam, 19:00 – 20:30, informal discussion afterwards. There are no regular fees for members. Athenaeum donates the meeting space for which we are most grateful. Book Club Members receive a 10% discount on any books purchased at Athenaeum. And Book Club members can purchase tickets for John Adams Institute events at the reduced Members price. The size of each discussion group is limited to 15 persons to facilitate discussion. For more information about membership, contact Glen at JABookclub@glenems.nl. In May we will read and discuss Assymmetry by Lisa Halliday. “…the story of Asymmetry — one of the stories, anyway — is loosely based on her own romantic relationship with Roth. Halliday was a young woman working in publishing in the early 2000s when she met Roth, just like her character Alice, an editorial assistant at ‘Gryphon’, when she meets Blazer. By making this information public, an official part of the novel’s ‘origin story’, Halliday is not simply fanning the flames of readerly curiosity. Rather, she is opening a door into the labyrinth that she has designed in Asymmetry, a book whose unusual structure is part of its fascination. Like Roth himself, who inveterately [sic] mixes up literature and life, Halliday encourages real-world identifications so that she can play with them and subvert them.” Adam Kirsch, The Atlantic, February 2018. Informal conversation and drinks afterwards. For a list of books we have previously read click here. For a list of books for discussion January through June 2019 click here.